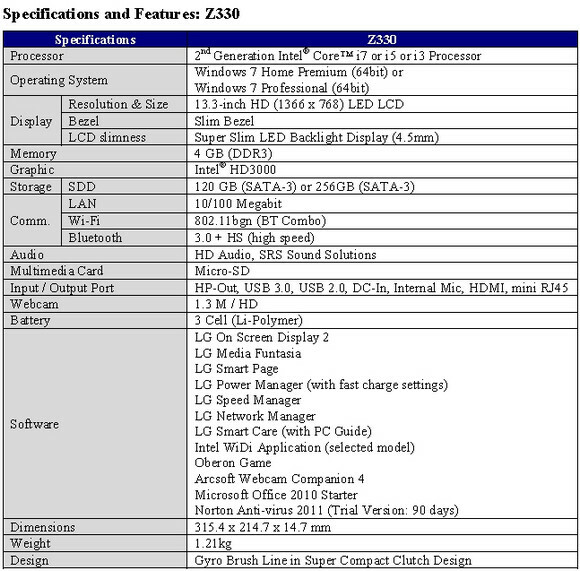 With CES 2012 just around the corner we expect there’ll soon be more competition for the ‘world’s thinnest laptop’ accolade, but right now LG’s new 13.3″ Xnote Z330 Super Ultrabook can claim the prize. The Z330 is truly wafer thin, measuring just .57″ thick and weighing a mere 2.67 pounds, but still managing to pack in a speedy Intel i5 or i7 processor. 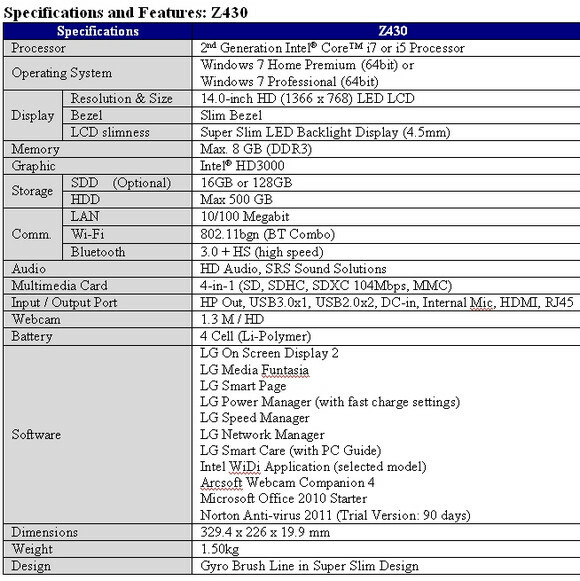 Coming with a 1366 x 768 LED-backit 13.3″ display, the LG Z330 also has 4GB RAM backed by 128GB or 256GB of SSD storage options, plus 10/100 ethernet, WiFi b/g/n and Bluetooth 3.0+HS. It’s larger brother, the 14″ Z430, is another waif of a thing, measuring .78″ thick and weighing 3.3 pounds. It’ll also be offered in i5 or i7 CPU flavours, but comes with 8GB of memory, and up to a 550GB HDD with the option of adding 16GB or 128GB of SSD storage. Both models come with a multiformat memory card reader, single USB 3.0, two USB 2.0 and HDMI, along with audio in/out ports. The LG Ultrabooks should be skimming the breeze some time soon. Where do we draw the line between a laptop and a netbook these days? I always thought a laptop had a DVD drive where as a netbook didn’t.